HOGAN UPS CHARTER SCHOOL FUNDING: Gov. Larry Hogan on Wednesday announced a series of initiatives to try to boost charter schools in the state, proposing new legislation and increased funding for charter schools in Maryland — including $2.6 million in his fiscal year 2020 budget for construction projects at charter schools and dedicating $1.2 million to charter schools from the Health School Facility Fund, which is reserved for critical repairs to heating and air conditioning systems, Luke Broadwater reports in the Sun. MILLER SAYS SENATE TO STREAM, TOO: One day after the House of Delegates announced plans to install cameras in the House chamber, Senate President Mike Miller appeared to endorse a similar move for his chamber, Bruce DePuyt of Maryland Matters reports. Speaker Michael Busch announced on Tuesday that House floor sessions will be live streamed starting in 2020. STATUE CONTRACT OK’d: Maryland’s Board of Public Works voted 3-0 Wednesday to approve a contract to create bronze statues in the State House of two slaves – Harriet Tubman and Frederick Douglass — who fled Maryland for freedom and became abolitionist heroes. The board approved a contract to design and install statues in the Old House of Delegates Chamber, Luke Broadwater writes in the Sun. The proposal for the statues was intended to mollify opponents of the one of segregationist Roger B. Taney that at the time was on State House grounds. The project also has been criticized by some officials for not having an open bidding process, Rachel Chason of the Post reports. PHONE FEE COULD PAY FOR 911 UPGRADE: Alison Knezevich of the Sun reports that Marylanders’ phone fees could increase to pay for major upgrades to the state’s 911 system under a proposal before the General Assembly. The measure would increase the monthly surcharge on residents’ phone bills from $1 to $1.25. In addition, each phone line on a family plan would be charged the fee. Currently, people only pay one fee per bill. OPINION: KOPP VULNERABLE: In a column for Maryland Matters, Josh Kurtz writes that state Treasurer Nancy Kopp seems to be in a vulnerable position, in this environment, where younger politicians are becoming antsy over the relative lack of opportunities to move up the political chain. It is the Legislative Black Caucus – or at least certain members of the caucus – who seem most anxious to see someone else in the job. FILLING DRUNK DRIVING LOOPHOLE: Accused drunk drivers who are not convicted but receive probation before judgment in a Maryland court would be required to use ignition interlock devices for six months under coming legislation, Steve Lash reports for the Daily Record. Sponsors say the measure will close a loophole in the state’s landmark 2016 law named for a police officer struck and killed by a drunk driver. PODCAST: ON HOGAN’s BUDGET: In this 25-minute Miner Detail podcast, Ryan Miner and Len Lazarick of MarylandReporter speak with Sens. Guy Guzzone (D-Howard) and George Edwards (R-Garrett/Allegany/Washington) on the governor’s budget and the process moving forward. PODCAST: HOGAN’s BUDGET, PRESIDENTIAL RUN: On this Roughly speaking podcast, Baltimore Sun reporter Luke Broadwater and Goucher College pollster Dr. Mileah Kromer talk about Gov. Larry Hogan’s inauguration, budget and whether “Hogan 2020” is real, before interviewing District 20 State Sen. William C. Smith Jr., a Montgomery County Democrat who is chairman of the Veterans Caucus. Sun reporters Pamela Wood and Liz Bowie join the discussion. REDUCING BOWHUNTING ‘SAFETY ZONE:’ Bowhunters in Washington County could shoot their prey closer to homes and other buildings under a bill local legislators are considering during this year’s General Assembly session, Tamela Baker of the Hagerstown Herald-Mail reports. The bill would reduce the size of the “safety zone” from dwellings, churches or other buildings from 150 yards to 50 yards for archery hunters only. Those hunting with firearms still would be required to stay 150 yards away. STATE UPS MO CO SCHOOL FUNDING: Caitlynn Peetz of Bethesda Beat reports that state funding for next year’s Montgomery County school operating budget could total $19 million more than school officials expected under the governor’s budget plan. The state provides roughly 27% of the Montgomery County public schools $2.65 billion budget and the governor’s proposal, released late last week, would increase the state’s contribution over the previous year by 4%, for a total of $735 million. OPINION: OPEN POLICE DISCIPLINE RECORD: In an op-ed for the Sun, retired Anne Arundel attorney David Plymyer opines that senators and delegates who represent Baltimore residents in the Maryland General Assembly talk a good game about restoring the public’s faith and confidence in the Baltimore Police Department. If they were serious about it, however, they would sponsor a local bill this session lifting the shroud of secrecy under state law that protects the disciplinary records of BPD officers from public scrutiny. CHAMBER OFFERS HELP FOR SMALL BUSINESSES: The day the bill to raise Maryland’s minimum wage to $15 was introduced in the House of Delegates with 67 Democratic sponsors, the Maryland Chamber of Commerce announced a new membership program designed to give the state’s small businesses greater clout, Diane Rey reports in MarylandReporter. FED WORKERS LINE UP AT FOOD BANK: The partial shutdown of the federal government reached its 33rd day on Wednesday. Federal workers affected by it lined up Wednesday in Lansdowne to receive free groceries from the Maryland Food Bank. The number of Marylanders seeking shutdown-related unemployment insurance benefits surged to nearly 4,000 — up 50% in less than two weeks. State farmers expressed growing anxiety about a delay of crop reports critical to making decisions about their budgets and how much to plant, Jeff Barker, Colin Campbell and Lorraine Mirabella of the Sun report. LOCALS CALL FOR END TO SHUTDOWN: County executives from across the region joined Baltimore Mayor Catherine Pugh Wednesday in Annapolis to call for an end to the federal government shutdown, saying they’re having to address services lost as a result of the month-long stalemate in Washington, Phil Davis reports for the Annapolis Capital. 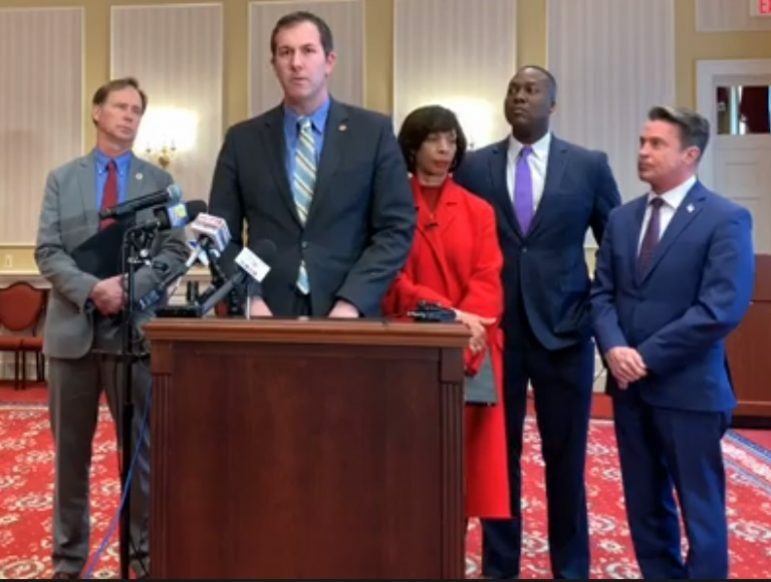 The leaders of Baltimore City, Anne Arundel, Baltimore, Harford and Howard counties said they are concerned about the effects of a continued federal lockout on their residents. The executives also said they expect local government budgets to be stretched as they look for ways to provide emergency services, Bryan Sears reports in the Daily Record. To meet the increasingly desperate outreach for assistance, local governments are encouraging food drives, making free school lunches more available, and urging private-sector companies and utilities to show lenience to customers unable to pay their bills, Bruce DePuyt of Maryland Matters writes. SUPREMES GIVE 10 EXTRA MINUTES: In an unusual move, the U.S. Supreme Court has reserved 70 minutes for arguments on Feb. 27 as it considers whether a 40-foot cross erected as a war memorial in Bladensburg violates the constitutional separation of church and state. Steve Lash of the Daily Record reports that the justices usually allow the parties a total of one hour to make their case before them. TRONE CHALLENGES CONSTITUTION: In a column for the Intercept, David Dayen writes that President Donald Trump has been reasonably condemned for attempting to trash the Constitution. But there’s only one active politician in America working to actually reverse a standing constitutional amendment. He’s David Trone, a freshman Democratic House member from Maryland’s 6th Congressional District. And his business, Total Wine, is currently embroiled in a Supreme Court case that challenges the 21st Amendment. TYDINGS BILL TO SPARE HORSES: Lawmakers in Washington have introduced a bill to honor the late Maryland Sen. Joseph Tydings. The U.S. Sen. Joseph D. Tydings Memorial Prevent All Soring Tactics Act would close certain loopholes that have allowed an abusive practice known as soring, which harms horses’ front limbs to create an exaggerated gait, Christina Tkacik reports in the Sun.